1. What Kind Of Schedule Are You Looking For? This is a very important question to ask! When most people think of a Project Schedule they think of a Gantt Chart. It takes quite some time to get to the point that you can have a schedule like this (see right). In the lessons below I will help you to create a Level 5 schedule with a work breakdown structure that is easy to understand. I will provide you with excel sheets that work together to create a schedule from the beginning of a project to the end. Tracking of what is happening is the most important parts of why we make a schedule. This shows us how we did with our plan for the project. There are many areas in which better planning will lead to a better job. A Gantt is not required to track a project. There are many other ways to show how your plan vs. actual is doing. Here is a picture of a project tracking excel sheet. In this chart we see the daily and running totals of how a project cost is tracking. Bar charts are one of the tools we will use to visually show show a project is planned and how the project being preformed. Level 2 - Project Summary (This will show the project in one line or one Schedule) This is a high look at all the areas that are Planned. Level 4 - Detailed EWP and FLWP are put together to identify the area and plans required to begin completing the tasks. 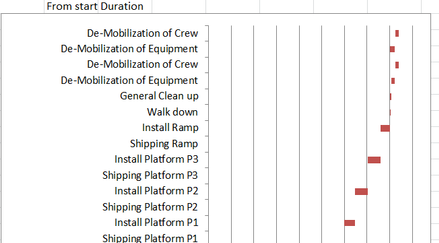 Level 5 - Detail Activities - List out every Activity required to complete the Packages (This will list out Staff, Equipment, and Materials required to complete the project. Here is a picture of a Level 4 Breakdown. Below is the Table of contents with a few questions for the rest of the lecture on Scheduling. This will be made available on the site coming soon. Where do you want to start to make your schedule? The Work Break Down Structure (WBS) is the first place that you should start. You need to create the WBS to allow for you to know from you bid how you activities will be tracked. The WBS is the levels and descriptions you will need to get the overall Schedule data base setup. I have attached and example of a full WBS I created as a example. You should be detailed with your level of the WBS so it is easy to put the activities where the work will be. What should you include in your schedule? Here is a list of items I use in my schedules. These items are set up in a row on one of my excel sheets that I use to set up my overall schedule. From all of these items I can generate a beautiful schedule. Most of theses items you will fill in from your estimate you have created from you budget to do the work. Hopefully you estimate is to the detail required for you to be able to compete the WBS and the Activity Coding and Activity description right from the estimate. The below items we can call our data base for you schedule as we can generate many different sheets tracking sheets to fill in the actual. At what level of detail do you want the schedule to be? This will all depend on the request made by you client. They should give you guild lines on how they would like to see you track the project. Most schedules start at a level 3 schedule as this give enough information to show show the project is planned. This is given with a bid you will send out or as a good over view of the over all project. In most cases you will only need a level 4 schedule as this will take you down to a group of tasks. When a project is awarded and you are going to do the work a level 2 schedule get down to the actual work activities and each item can be tracked to show how the over all project is progressing. Who will have input into the break down and tasks you will be using? 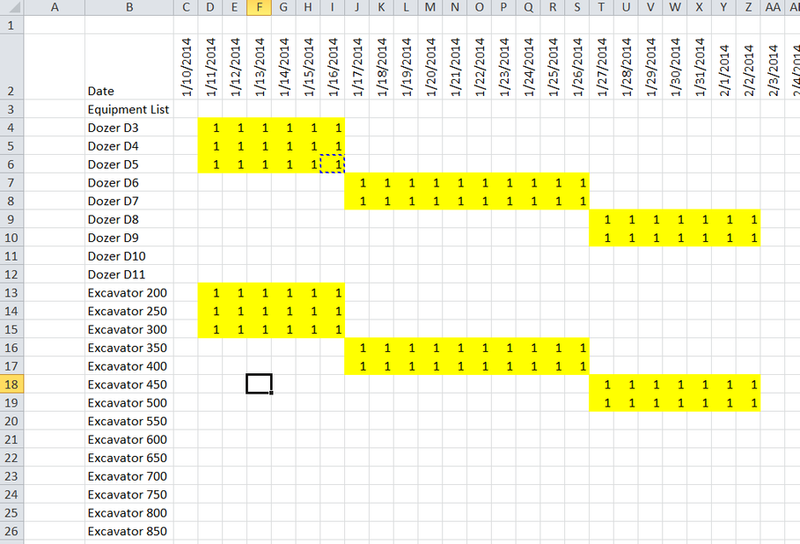 One most of my project I set down with the estimator to create the WBS and with the Site Super to create the schedule. You may not be have both of those people working with you or you may be the person who gets to do both estimate then complete the project. If you are that person then you should of built you estimate just like you would do the work Making it easy to convert project estimated tasks in the the schedule activities. If you are a project Scheduler and in you case have neither of these staff to help you. You will then need to create the best schedule you can and the update it along the was as the real work occurs. What type of schedule do you want to put together? Will it be driven by hours, production, Dates or % complete? This is a great question that can be determined in how you report the project progress. On the projects I have worked on they have been down by hours earned for the % complete on the project. Others have been driven by the total quantity completed in the planned duration. Both are good ways to show how the project is going to be tracked. I would use what ever is the best so show the completion on the job. If you know the exact hours required for the quantity you are installing then hours is the best to go by. If you did not do a bid by hours but you know what the total quantity is then go by the quantity. Make this part easy on you. What is the fastest way to build the schedule I want? Use the estimate as your schedule. It should have all the information you need to complete a level 3 Schedule. 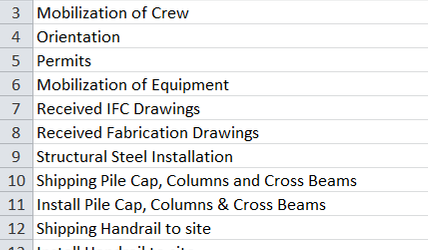 Someone has taken the to review the plans and set out the quantities for the over all project. These can be your guild to creating the over all schedule for any project. If you do not have a take off then you might have to do it from reviewing the plans and dates that you have been give as Mile stones. It would also be helpful if you had a good template to go by as a guide. What Work Breakdown Structure should I use? This will cover all the area of you project in 21 simple over all schedule activities. Who will see my schedule? Your schedule is build for a few different purposes. The one that is is most used for is showing your client how long you feel it will take to complete the tasks that you have bid. And this schedule can be used as a baseline on how the project your project will be completed. Below I show and sample of a completed Scope of work. All the Items that are in green a new tasks that were not in the original schedule (They added on significant time to the finish date). All items in blue are the original schedule activities. The grey bar that is under them is the base line that was saved before the project started. In this schedule you can see based on the new schedule updated that the Schedule was 8 days then turned into 30.1 days to complete. For this project there was a large change order based on the Stand-by, additional materials and additional days required to deal with the soil conditions. In this case a 100,000.00 turned into a 365,000.00 project. This schedule was a great tool to show the client the impact of the soil conditions. You can see that the only mile stone met was the start date. All of the other mile stones - Complete Field work and Complete Turnover where not met. Above: Sample MS Project Complete Project with Gantt Chart. Will your schedule have production units and cost unites attached? The overall project can be tracked in a few different ways. The most common is by production units and by cost units. What templates do I need to get my schedule going? This Gantt Chart is set up so that as you put in the activity dates it will fill in the Gantt to the right. How long do I think this should take? You should put together a duration that you want to complete your schedule in. I would base it on the total number of man hours you have in your estimate. For every 50 Craft hours I would estimate 1 Planning hour. This would be for a complete level 5 schedule with all the bells. How am I going to track this? Each way has its bonus as you use them to track the project. We see most schedules based on the material that is installed. For an example the number of cubic meters/yards poured in a foundation. Each line item in your schedule can be based right out of your estimate. Based on how you set up the tracking of the project and the way the project is billed can play right in the you monthly invoicing. For and example if you have a lump some contract we would recommend a % complete tracking system. This will show base on the % complete the total billing you can invoice each billing period as as this will match the over all cost for the project being complete. If the date to cut of you invoice was in the middle of you activity you will want to have you schedule up to day on the day of the invoicing. let say on the 20th of every month. Here is a mob line item in the schedule to show the thought process we are discussing. Mobilization- Lump sum of 50,000.00 - Planned duration 5 days - Actual complete duration 3 days - 50% complete - Billing $30,000.00 - Start Date May 18th, Current date and invoice date May 20th. As you have put your schedule together there will be dates by which you will want to complete certain activities. These set dates are your mile stones for the project. For example if you were billing a home you may want to have the framing complete by a certain date. In our case we wanted to have our home dried in before the the snow falls. In some places this is the end of October. We have placed a schedule for construction of a home below to show how this would looks. Now that the job is set up lets look at the Work Breakdown Structure for your project. What does this have to do with my schedule? The WBS is set up to show the overall tracking of the budget. As you complete each Item with the % percent here is an example below. As each project items is completed the project cost can be updated. This works great for project that have units that you track for completion. Use conditional formatting to place fill color themes in the cells. Set up an if statement that places the sum of the required production per day in the date cells. These are a few ways that you can make up you new schedule. All they ways you want to make this you will need to get good a using a if statement in excel. This is a key part of how the make the gantt work. Building a Gantt Schedule with a chart in excel. Start Milestone - This simply is the date when a planned date should start. Finish Milestone - This also simply is the date when a planned date should finish. Task Dependent - Each task can be set up to allow for it to follow other tasks. These tasks can be dependant on the first task being completed. This can set out the order of the installation of the work at hand. See the above schedule to see how the bars will change based on the takes that need to be complete first. For example permits will have to be pulled before and work can begin. Resource Dependent - This is where you can set up the Material, labor and Equipment that are required to complete the scope of work. WBS Summary - This is covered above. ﻿There are 4 ways to set us the Dependents for each task here are the chooses you have to set up how the task will interact together. With each activity that you have in you schedule it is always a good idea to optimize the relationships between activities. Often you will see the need to place time between two schedule activities. This is called Lag. Lag is were we see that there is time required before the next activity can start. An example of this is when you have placed a stain on Hard wood floors and you need 3 day before the trim can be placed. This drying time between these to activities is the lag (3 days). There is no work nor resources required involved just time to pass. Float is the amount of time that activities cab be moved with out changing the schedule. Float is often referred to as slack. There is two kinds Fee Float and Total Float. Free Float is the amount of them between to activities before the activity before it will move the nearest successor. Total float is the amount of time a task could be delayed without impacting the project finish date. This area is just for users who would like to use both Microsoft Project or P6. Both of these products give you the ability to input Equipment, Manpower and Materials for each project activity. In excel it works a little differently to put in Resources. Please see the below excel with a few options on how to set up you schedule with resource loading. Using these values, CPM calculates the longest path of planned activities to logical end points or to the end of the project, and the earliest and latest that each activity can start and finish without making the project longer. This process determines which activities are "critical" (i.e., on the longest path) and which have "total float" (i.e., can be delayed without making the project longer). In project management, a critical path is the sequence of project network activities which add up to the longest overall duration, regardless if that longest duration has float or not. This determines the shortest time possible to complete the project. There can be 'total float' (unused time) within the critical path. For example, if a project is testing a solar panel and task 'B' requires 'sunrise', there could be a scheduling constraint on the testing activity so that it would not start until the scheduled time for sunrise. This might insert dead time (total float) into the schedule on the activities on that path prior to the sunrise due to needing to wait for this event. This path, with the constraint-generated total float would actually make the path longer, with total float being part of the shortest possible duration for the overall project. In other words, individual tasks on the critical path prior to the constraint might be able to be delayed without elongating the critical path; this is the 'total float' of that task. However, the time added to the project duration by the constraint is actually critical path drag, the amount by which the project's duration is extended by each critical path activity and constraint. A project can have several, parallel, near critical paths; and some or all of the tasks could have 'free float' and/or 'total float'. An additional parallel path through the network with the total durations shorter than the critical path is called a sub-critical or non-critical path. Activities on sub-critical paths have no drag, as they are not extending the project's duration. CPM analysis tools allow a user to select a logical end point in a project and quickly identify its longest series of dependent activities (its longest path). These tools can display the critical path (and near critical path activities if desired) as a cascading waterfall that flows from the project's start (or current status date) to the selected logical end point. Although the activity-on-arrow diagram ("PERT Chart") is still used in a few places, it has generally been superseded by the activity-on-node diagram, where each activity is shown as a box or node and the arrows represent the logical relationships going from predecessor to successor as shown here in the "Activity-on-node diagram". If a critical path activity has nothing in parallel, its drag is equal to its duration. Thus A and E have drags of 10 days and 20 days respectively. If a critical path activity has another activity in parallel, its drag is equal to whichever is less: its duration or the total float of the parallel activity with the least total float. Thus since B and C are both parallel to F (float of 15) and H (float of 20), B has a duration of 20 and drag of 15 (equal to F's float), while C has a duration of only 5 days and thus drag of only 5. Activity D, with a duration of 10 days, is parallel to G (float of 5) and H (float of 20) and therefore its drag is equal to 5, the float of G.
These results, including the drag computations, allow managers to prioritize activities for the effective management of project completion, and to shorten the planned critical path of a project by pruning critical path activities, by "fast tracking" (i.e., performing more activities in parallel), and/or by "crashing the critical path" (i.e., shortening the durations of critical path activities by adding resources). Please send us your questions so we may add them to the above training. Submit below.